Widespread employment as we know it is coming to an end in western countries. It will be quite a shock. Unless the Alps turn out to be the birthplace of a new system of seasonal pluriactivity. With mobility and risk taking. Can the experience gathered by Alpine populations over a century teach us something about our brave new world ? No change in the Alps ? Lois Hechenblaikner reveals mixed views on his native Tyrol in an unusual set of paired photos. Mountain peasants from yesteryear, tourism today, the Austrian Alps have changed. And the Tyrolean population has changed jobs, a fact that the photographer shows by pairing his own photos with archive images of Armin Kniely, an agricultural engineer. Stark labour on the one hand, recreational kitsch on the other. Disturbing. Lumber jacks, floaters and reapers could have served for the title of this moralising text published in 1873, in Les montagnes by Albert Dupaigne. This beautifully illustrated, didactic book primarily describes the physical phenomena specific to mountain regions, but a chapter also looks at how humans adapted by developing special activities. 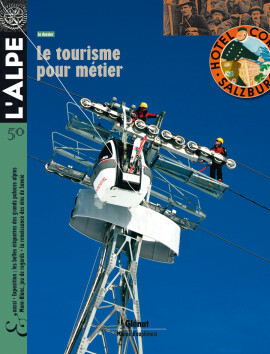 Being inventive and versatile, people in the Alps seize every opportunity in their professional lives. Turning to their advantage the limitations inherent in a region marked by travel, tourism and recreation, they have invented multiple occupations. A panorama. The death of mountain guides ? Will standardisation of mountain activities by tourism do away with mountain guides ? Caught up in the development of sports ranging far from their Alpine culture, the invasion of legal considerations and clear reductions in regional differences, the guides are unsure what to think. Here is the opinion of one guide. This son of the Alps has certainly done every job invented in the mountains. And then some. A youth spent in ski resorts, between the family inn in Val d’Isère and various escapades with the guys, guides, shepherds and slope managers. An account in the first person singular reminiscent of those in the tenth anniversary issue of L’Alpe. Is keeping a mountain refuge a matter of profession or passion ? Two women discuss, in bits and pieces, their summers spent on high. It is not always easy to keep a refuge up and running, one must have mastered a thousand different jobs. All the best addresses for information and training for jobs in the mountain tourism sector. Info prepared in collaboration with Onisep. No stereotypes and clichés, just subtle juxtapositions of photos offering a « different » vision of the Alps in a handsome little book published recently. Playing with textures and shapes, wide angles and panoramas, the pairs of images talk back and forth, deforming mirrors providing a surprising visual recreation and re-creation. The wonderful publicity stickers offered by hotels and formerly found on travellers’ baggage are on exhibition at the Mountain Museum in Torino. An illustrated voyage through the various periods of tourism in the Alps and other mountain ranges from 1890 to 1960.